Bring their imaginations to life with whimsical bedding collections by Waverly Kids. 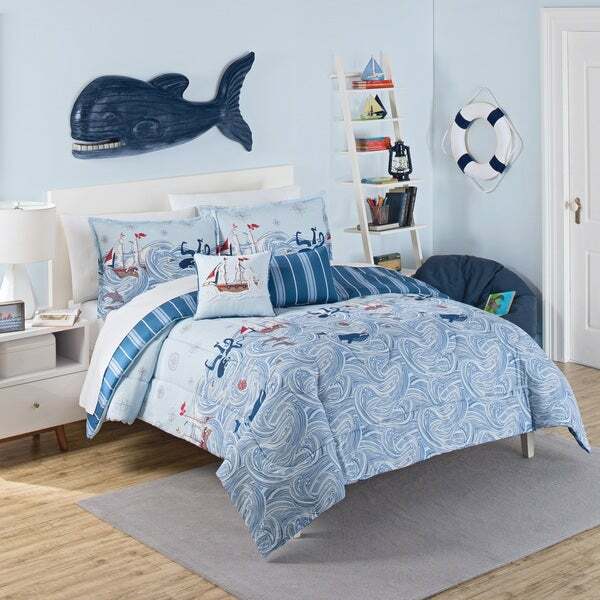 This adorable collection features an allover sea scene with pirate ship, octopus, and whale motifs. Reverse features decorative horizontal stripe in white on a navy ground. Set includes reversible comforter and coordinating shams. 100 Polyester. Machine washable. Coordinating Ride the Waves decorative pillows sold separately. Love this comforter set, vibrant colors, washes well, so far we have been enjoying it. Order came very fast without any issues. Would by it again. My son loves his new comforter for his room. Such a cute blanket, his room Is whale. Shark, and octopus themed. All the colors look just like picture. Love the wave comforter set ! Goes well with my nautical theme ! Nice comforter. Material is ok.
"Do you have 2 twins comforters? Extra pillows? Can't find them!"